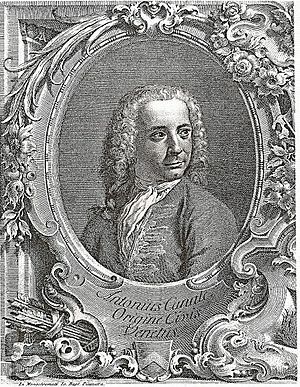 Giovanni Antonio Canal (17 or 18 October 1697 – 19 April 1768) was an Italian painter from Venice. Today, he is mostly remembered for his landscape paintings. Some of these landscape paintings which resemble the views found on modern-day postcards are known as Vedutes today. He was also an important printmaker in etching. The Grand Canal and the Church of the Salute, painted 1730. Return of the Bucintoro to the Molo on Ascension Day, painted 1729–32. The Stonemason's Yard, painted 1726–29. Canaletto Facts for Kids. Kiddle Encyclopedia.